Mocking and name calling ensued. In third grade a girl who was a head taller than me grabbed my finished handwritten essay and tore it to shreds before I could hand it to the teacher. I had to rewrite it. The worst bullying came in sixth grade. I spent the summer between fifth and sixth grade with a girl I’ll call Gwen. We went to the same day camp and often played board games after camp and on weekends. When school started though, Gwen wanted to be with the cool kids. Her entrance into that club was to taunt me publicly. I couldn’t understand the abrupt change in our relationship. This continued for two weeks. I hated going to school and feared each day. I didn’t know what to do. My father told me that the only way Gwen would stop was if there was a risk that she’d get hurt or embarrassed. I needed to hit her. The idea of punching another girl was foreign to me. I didn’t know if I could muster the courage, especially with a crowd rooting against me. One day I was walking home with my sister and Gwen was walking ahead of us, alone. I still couldn’t throw the first punch. I baited her until she punched me and then I let loose. Three weeks of anger came out. Gwen ran home crying. I’m not proud of hitting someone. But I am proud of standing up for myself. Bullying isn’t confined to the school yard. Even brands get bullied. Crocs launched their brand in 2002 on resin-made clogs that were originally made as boat shoes. The resin, branded Croslite, was lightweight, resisted odor and fungus, and conformed to the wearer’s footprint from body heat. These properties made Crocs clogs incredibly comfortable. The comfort and novelty aspects of the clogs drove them to early success. Crocs notched $850 million in sales in 2007, netting $200 million in profit. The following year Crocs lost $200 million, having oversaturated their market and spent their novelty. Since 2008 the brand has had a bumpy ride. Initially trying to appeal to everyone, Crocs struggled to appeal to anyone. Alongside the challenge of generating profits, Crocs faced a difficult duality. Crocs clogs polarized people into lovers and haters. Lovers extolled the brand’s comfort and practicality. But haters were more vocal, accusing the brand of being ugly and unfashionable. Some haters raged in diatribes on blogs or by making videos of themselves burning Crocs or cutting them up. When I wrote about the brand in February 2015 Crocs was mired in a brand adolescence identity crisis. I recommended that the brand anchor its identity to its comfort characteristic and that it seek to market the emotional benefits of the brand. By then Crocs had already embarked on the path to self-discovery. Unfortunately, like many adolescents, it was the wrong path. 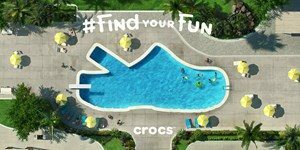 Launched in March 2015 with ad agency McKinney Global, Crocs’ “Find Your Fun” campaign centered on fun instead of comfort. It featured breezy images of swimming pools and other environments shaped like the brand’s iconic clog along with videos of people dancing and playing in their Crocs shoes. Watching other people have fun was just that. Watching. The audience were spectators to other people’s fun. The campaign did not engage the hearts of its customers. After an initial bump in revenue, year over year sales declined 6.3% in the second quarter of 2016 and 11.6% in the third. By the second half of 2016 the “Find Your Fun” campaign had fizzled. Crocs management went back to the drawing board, hired a new agency (Yard) and developed a new campaign. This time Crocs embraced comfort not only physically but psychologically. A kind of play on being comfortable in one’s own shoes. 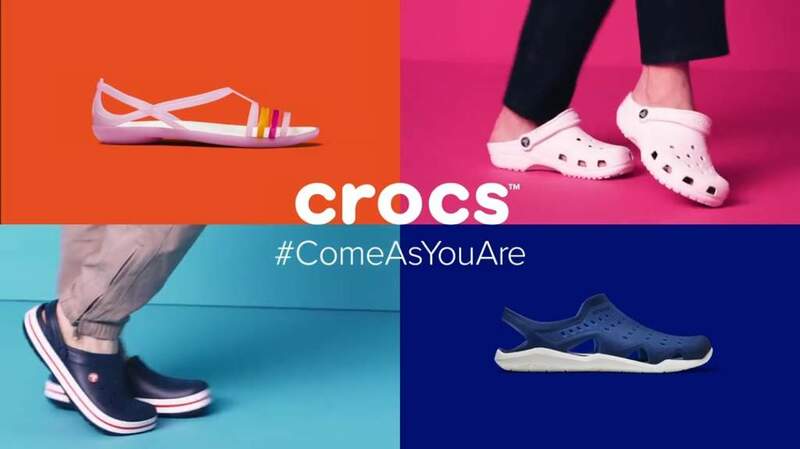 Crocs’ “Come As You Are” campaign launched in April 2017 and proclaimed the brand’s pride in being just who they are. The campaign tapped celebrities who could relate to being unique and who appealed to Crocs’ target market countries – the United States, Japan, China, Korea and Germany. Wrestlemania star Jon Cena talked openly about being bullied when he was 14 years old and how it led to him finding his passion. The “Come As You Are” campaign has resonated with customers, some of whom have posted pictures of themselves on social media wearing their clogs all over the world. At the same time Crocs management developed a plan to become leaner operationally, including the closure of 160 underperforming company stores between 2017 and 2018 to bring their total to fewer than 400. The company has also outsourced production and reduced its global product line to focus on the most profitable offerings. Crocs has posted three consecutive quarters of revenue increases (6.2%, 5.7%, 4.7%) despite significantly fewer stores and the charges that came with closing them. Meanwhile collaborations with designers Christopher Kane and Balenciaga have emphasized Crocs as innovative and have provided buzz value. Crocs seems to have found their identity and hit their stride. It’s heartwarming when any adolescent develops and forms their identity. It’s also a huge relief. When you don’t know who you are, your audience defines you the way they want. When you get clear on your identity and communicate it, you direct the conversation. Is not tied to a product, but to an attribute and a message. This allows their brand to inform every aspect of the business – operations, marketing, and the way they treat all of their constituencies. Rings true. Love them or hate them, most people agree that Crocs shoes are comfortable, making the message authentic. Resonates emotionally. The desire to be accepted for who we are and to celebrate it is a widespread human emotion. Broadens their audience. Defined functionally, Crocs were thought to be the province of children, health care professionals and restaurant workers who spend all day on their feet. Positioned as a personal statement they appeal to anyone who subscribes to their message. One other thing to note: Crocs’ marketing misfire was not lethal. My guess is that they learned much from the first campaign that informed the second. Don’t be afraid to try something new with your marketing. Trying something new was my ticket to a better life. The summer after sixth grade I went to sleep away camp for the first time and made tons of friends. That experience made me realize that I was not who the kids at school portrayed me to be. From that moment on I explored new communities and new activities as I began to define who I was for myself. Great post. I did not realize the roller coaster ride they were on, and I love your conclusion that the brand and messaging has to resonate emotionally. I also appreciated how the croc story was woven into a childhood moment of yours. In a way that was an emotional hook that might help you to relate to crocs. Thanks so much Jill! In the end marketing is human to human and emotional connections are more meaningful than logical approaches like listing benefits.